In an attempt to reconceptualize the destruction caused by the American Civil War “as an imagined state, an act of destruction, and a process of change,” Megan Kate Nelson innovatively combines environmental and cultural history methodologies (p. 9). Using an interdisciplinary approach, Nelson explores how Americans--Northern, Southern, black, white, female, and male--interpreted the large-scale obliteration of cities, houses, forests, and soldiers' bodies. 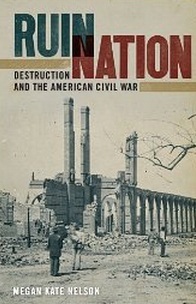 By emphasizing ruin as both a metaphor and a reality, the author proves that the Civil War both destroyed and created, which allowed many Americans to cope with the war and to find a common ground in spite of the national divisiveness. To demonstrate that ruin affected all aspects of life between 1861 and 1865, Nelson divides her work into the destruction of urban areas, individual houses, wilderness, and soldiers' bodies, specifically amputees. She aims to show that almost every soldier and civilian encountered the fragments of war in some form. By organizing her work into these four sections, Nelson strives to illustrate that Americans understood these ruins in different ways depending on who they were, where they lived, the type of object destroyed, the moment in time, and the perpetrators. The author illuminates that both Northerners and Southerners reacted in similar or identical ways to wartime ruination. For example, Nelson maintains that all types of ruins (whether they were scarred soldiers' bodies, flattened forests, burned cities, or raided homes) were short-lived and all Americans were able to wipe the ruin from their consciousness and start anew. Beginning with an environmental history approach, Nelson examines the narratives and images that Americans produced as they confronted architectural ruins--cities and houses. Both soldiers and civilians used the devastation to explain the “savage” nature of men on both sides. Even if the destruction was a result of military necessity and strategy, civilians saw it as barbarity. For instance, Union soldiers destroyed Southern homes as revenge and deterrence against guerrillas. Yet, Southerners saw such as a breach of privacy, humanity, and proof of Union savagery. Likewise, the invasions into the domestic sphere proved that Northern soldiers were barbarians. To Southerners, this was “personal pillage” (p. 79). Nevertheless, as Nelson reveals later, Southerners also used destruction as a form of revenge when they burned Chambersburg, Pennsylvania. According to the author, both Union and Confederate soldiers, who accidentally or deliberately created domestic ruins, understood such as the expected consequence of warfare. So although they may have disagreed on the motives, many soldiers accepted the debris and found a common ground through destruction and ruin. Unlike cities, houses, and forests, however, Americans did not easily forget or cope with the high number of mutilated soldiers’ bodies after the war. While they were still ephemeral (men eventually die), the prevalence of amputees stirred countless anxieties about wartime technologies and the possibility of the “machine man” (p. 161). Therefore, while Nelson’s examination of the destruction of cities, houses, and forests is enlightening, her cultural analysis of wartime amputees is especially profound. Adding to the historiography, Nelson proves that historians have overlooked the cultural significance of the “missing and rebuilt limbs” of veterans (p. 9). By examining the “empty sleeves and government legs” that haunted postbellum cities and towns, the author shows that, like the urban and natural ruins, bodies held their own symbolic meaning and source of rebirth (p. 161). Nelson argues that for the American public--both Northern and Southern--disfigured men presented a problem for postbellum society, because they threatened Americans’ concepts of masculinity and even humanity. Nelson also maintains that mutilated men even destabilized beliefs about citizenship and restructured Americans’ thoughts on death in general. Nelson’s innovative analysis of the impact caused by more than a million shattered and broken men is by far the strength of her work.